"I say, I say, I say, why did the monkey cross the road ?" 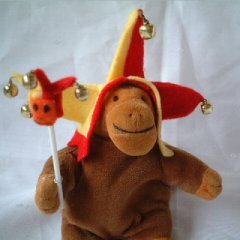 Mr Monkey's jester's cap is homemade from felt, with smallish bells from the craft shop. 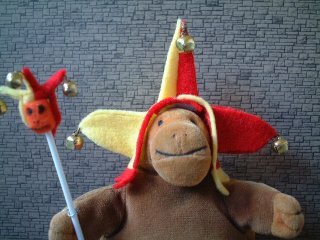 His slapstick is balsa wrapped in felt, with smaller bells and a handle which used to be part of a cotton bud.